Learn the Nerve grafting for digital nerve defect (autograft using medial cutaneous nerve of forearm) surgical technique with step by step instructions on OrthOracle. Our e-learning platform contains high resolution images and a certified CME of the Nerve grafting for digital nerve defect (autograft using medial cutaneous nerve of forearm) surgical procedure. Patients with nerve injuries sometimes present late due to a variety of reasons. Unlike a motor nerve where there is muscle atrophy after one year, a sensory nerve can have a delayed repair even years after the injury. Patients with unrepaired sensory nerves often have neuropathic pain from end neuroma along with loss of sensations. The patient discussed here had a glass laceration to his left hand four weeks ago. He was lost to follow up after the initial assessment and came back with a healed wound, inability to fully flex his little finger, loss of sensations along the ulnar side of the little finger and neuropathic pain. He had an X-Ray to rule out glass foreign bodies. The clinical diagnosis was of an injury to ulnar digital nerve of left little finger and a possible partial flexor tendon injury. The option of a nerve grafting was discussed with the patient. 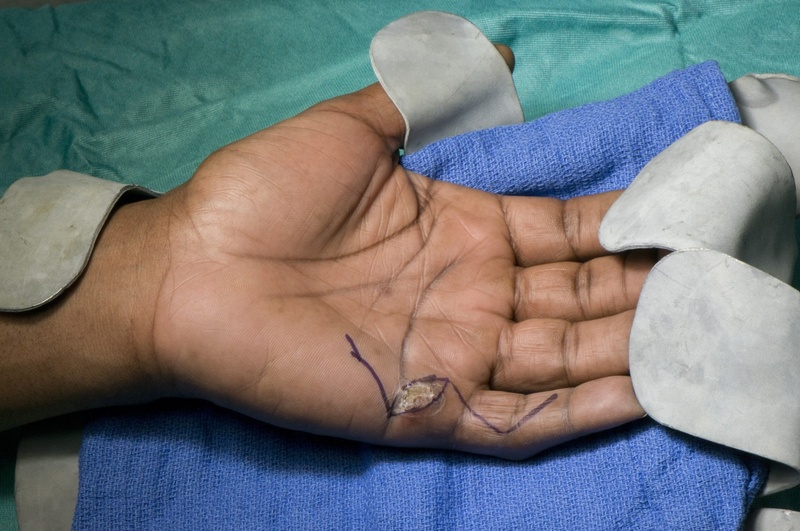 Though there are other options such as allografts and conduits, their use may be limited to gaps less than 3cm. The donor nerve chosen in this case is the medial cutaneous nerve of the forearm which is a direct branch from the medial cord of the brachial plexus. The alternatives are sural nerve, lateral cutaneous nerve(which is a continuation of musculocutaneous nerve) or posterior interosseous nerve. Posterior interosseous nerve causes the least donor site morbidity but the length available is limited. The main donor morbidity from the medial cutaneous nerve of the forearm is a patch of numbness in the medial aspect of the forearm. There is a small risk of a painful neuroma in the proximal stump of the donor nerve and for this reasons, most people bury it in the FCU muscle. Institution : The Queen Elizabeth Hospital ,Birmingham ,UK.